Elizabeth Dzelme at work in the edible garden. Joondalup Mayor Troy Pickard recently unveiled a plaque to officially open the Duncraig Edible Garden. Mr Pickard, who joined more than 50 people at the launch, said the garden at the front entrance of Duncraig Library was a welcome addition. ‘The City has been a strong supporter of this project from the outset,’ he said. ‘The Duncraig Edible Garden is already proving popular with local residents having recently hosted several well-attended workshops,’ he said. 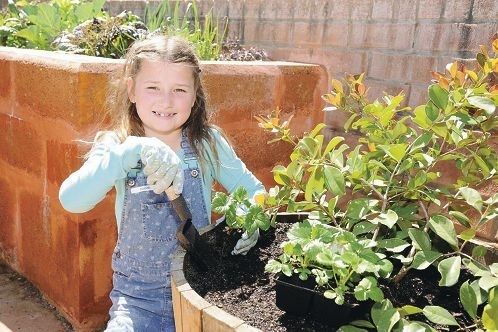 Joondalup Council voted earlier this year to support a two-year community garden pilot project, providing the Duncraig Edible Garden committee with funding to buy materials, plants and tools as well as help with landscaping, infrastructure and waste removal, City Watch patrols and toilet facilities. The City’s contribution of $22,000 included the buying of planter boxes, signage, a lockable cupboard, outdoor furniture and a wooden work bench which sits on top of two barrels.